Read below for a brief summary of the Bon Accord Steam Engine Club and a potted history of the club and its evolution. Steam haulage and transport was the accepted way of moving large volumes and heavy goods for many years up until the end of World War II. Steam began to lose favour as the Internal Combustion engine came into prominence. Unfortunately many steam engines were scrapped at the end of their working lives. Thankfully, a few were lucky enough to be preserved and survive today as the magnificent machines that can be seen by enthusiasts around the country at vintage rallies most weekends during the summer months. The Bon Accord Steam Engine Club (BASEC) was initially founded by the late Bill Barrack, Dod Sim, Jim Coutts and associates in 1975. Although the first ever rally was held at the Bridge of Don Aberdeen 1967, right. (currently the location of the Aberdeen Conference Centre). 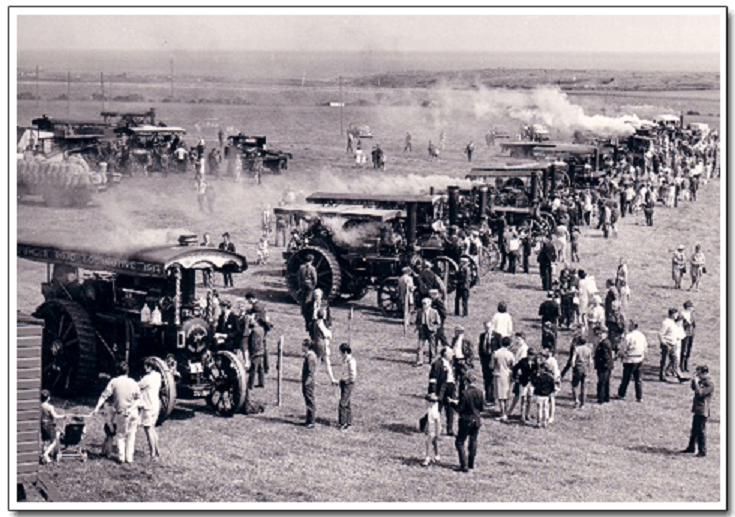 More and more of these magnificent machines were ending up on the scrap heap, so the objective was to recruit like-minded people interested in maintaining interest in all types of self-propelled steam engines and vehicles. Working together to preserve them, a part of our history, for future generations. The Club also supports any moves to preserve portable and stationary steam engines. For more information on the club’s current committee or to contact any of the members, you can click here to find out more. Since those early days the Club’s annual Steam Fair has been held at various locations around Aberdeen and Aberdeenshire. In 2004 the Club joined forces with the National Trust to stage an all-new event at what was hoped would become a long-term location, Castle Fraser Aberdeenshire. Our annual event is now called the Bon Accord Steam Fair at Castle Fraser. Usually held in the middle of the month of June and is going from strength to strength. By 2006 the event attracted 29 steam engines, over 100 tractors and about the same number of Stationary Engines. Our most recent 45th anniversary in 2015, numbers had grown with some 40 steam engines. Over 100 tractors, two typical fairground rides, numerous little engines, entertainment and a wide range of stalls attending. For more information on our Steam Fair visit the Bon Accord Steam Fair page here.